As the construction industry’s skills crisis remains sharply in focus, especially in light of potential limits on EU migration post-Brexit, we’re continuing to reach out to talented 18-year olds with an attractive career proposition. Over many years Wakemans has developed a work/study programme that enables students who have completed their A Levels to achieve the RICS-approved BSc (Hons) quantity surveying degree. Our ‘earn-while-you-learn’ approach combines on the job training with approved tuition delivered by Birmingham City University. The firm pays the tuition fees and at the end of the five-year course not only do young professionals benefit from a full-time job with excellent prospects, but they are also debt-free. John Woodhall, Executive Chairman of Wakemans, says: “Since a third of the construction industry’s workforce is now aged over 50, we look to bring in new blood through a training programme that allows young people to earn a living whilst also developing new skills and studying for a professional qualification. The latest Wakemans recruits have enrolled on the quantity surveying and building surveying courses with Birmingham City University. 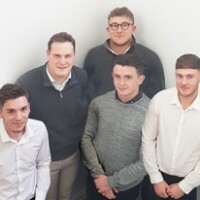 Meanwhile, three trainee surveyors have completed 12 months of training with the firm and have also embarked on their studies whilst a further two are entering the final year of the degree course. Image above: Five of the Trainees currently employed on the Wakemans training scheme.